An arch over the bridal altar, or the wedding aisle creates a magical ambience for your wedding ceremony. An arch placed at the reception entrance is a beautiful addition to wedding decorations. Explore the different ways to decorate and customize arches to match the style and design of your big event! A classic tulle arch is perfect for a garden wedding, and adding flowers at the peak and corners of a double arch will help it coordinate with your other floral decorations. A simple garden arch perfectly defines the beginning of the wedding aisle. Many formal gardens and other popular wedding sites will have such arches already in place, and it would be easy to drape flowers or color coordinated bows on the arch to match your wedding theme. At the same time, however, a plain arch is still stylishly elegant. Adding a touch of color to your wedding arch coordinates it easily with your celebration. Flowers, tulle streamers, or satin ribbon can all be used to add draped color to a simple arch. 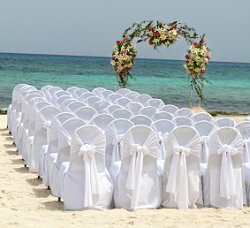 Bridal arches are popular decorations for beach weddings because they help define the sacred ceremony site. At the same time, a simple, natural arch is an elegant and lovely choice without going overboard. Large palm fronds or a wooden arch can easily be erected on a beach. Another natural option for a beach wedding is a simple arch woven from natural grasses. Using a thin wire framework, weave the grasses into the arch and decorate it with interwoven tulle and coordinating flowers for a burst of color. A thicker tulle arch with a simple canopy is a lovely option for any outdoor event. Leave billowing swags of the tulle loose and free to move in the breezes, but secure the columns with floral garlands to keep the tulle under control. A simple railing draped with tulle can be used as a backdrop for this type of arch, and adds more distinction to the ceremony setting. A simple arch may seem too thin and insubstantial for different settings, and adding side urns that coordinate with the arch decorations is a way to further define and decorate the ceremony site. Greenery such as ferns, ivy, grasses, and palm fronds is popular, and adding tiki torches to the display is a nice touch for an evening event. The entrance to a garden gazebo naturally has an arch that helps frame the wedding site. Decorate that arch with a swag of flowers and add coordinating bundles of flowers to the side columns and railings of the gazebo for a finished look. For even more detail, string tulle swags down the aisle. A simple wooden arch is a natural, understated beach wedding decoration. Wrapping the arch with tulle gives it a gentle wedding touch without being overwhelming. For an evening event, white lights could be wrapped in the tulle, or flowers can be tucked into the wrapping for a morning or afternoon wedding. A wedding arch not only makes a sophisticated backdrop for a wedding ceremony, but it is also a beautiful setting for bridal portraits. Flowers worked through the arch can coordinate with the bridal bouquet, and capturing the arch in photographs will help preserve your wedding memories. Many formal gardens and parks have arches of flowering vines or interwoven twigs, and it is easy to decorate those natural arches or tunnels with balloons, tulle, streamers, ribbons, or flowers to coordinate them with your wedding colors and theme. This will add a simple touch of celebration to the site so it will be beautiful and memorable. Not all bridal arches are outdoors. A lattice arch can be used inside your wedding reception as a backdrop for the head table, over the cake table, or near the guest book. Many couples also coordinate arches at the entrance to the wedding hall or where they will exit at the end of the evening. An arch at the end of the aisle helps define the area where the wedding will take place. A dramatic green arch is always lovely, and simple flowers at the peak and corners of the arch coordinate with the wedding colors and other flowers. If you do choose an arch as part of your aisle, however, be sure it is not too narrow for your dress to easily pass through when you are walking with a partner (either being escorted down the aisle or when leaving with your groom). Instead of just an arch, many couples opt for bridal canopies. A canopy defines the entire wedding ceremony space where the couple and officiate will stand as vows are exchanged, and it can provide a beautiful backdrop during the happy event. A simple canopy can be made from tulle, or couples may choose more substantial, elaborate designs. If you don't think your ceremony site has any arches, look again. Many churches, castles, formal gardens, and other popular wedding venues have natural arches as part of their design and architecture. These make perfect spots for elegant and romantic wedding pictures or to be incorporated into the ceremony itself. Looking for more ideas for bridal arches? Check out these pictures of wedding arches for more inspiration!